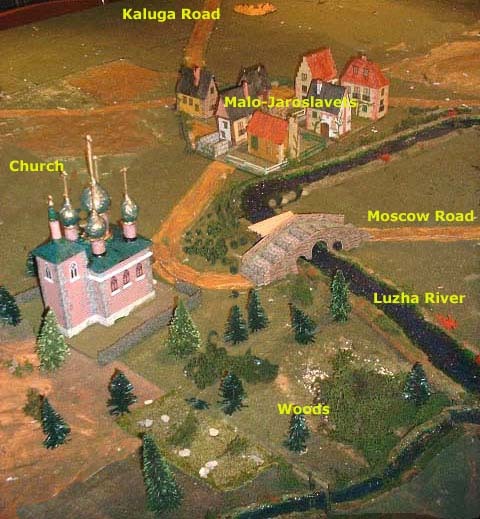 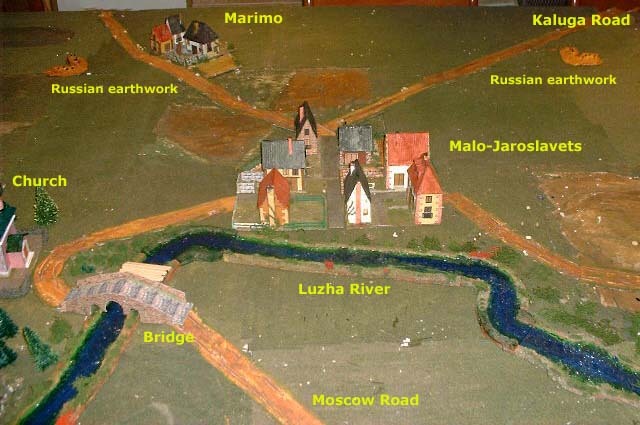 Russia, October 1812. 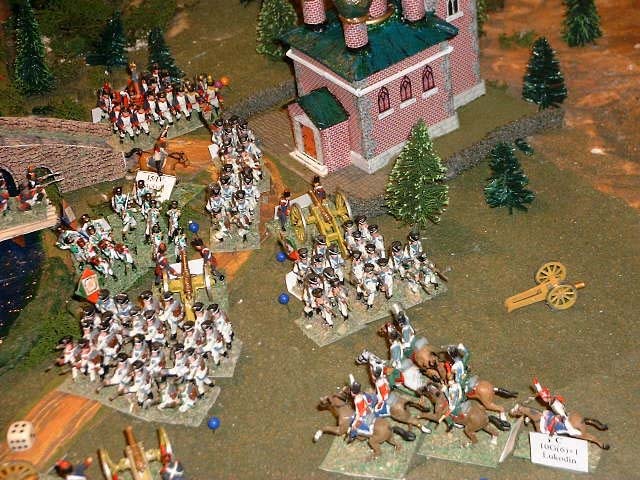 Napoleon’s Army is trying to retire from Moscow. 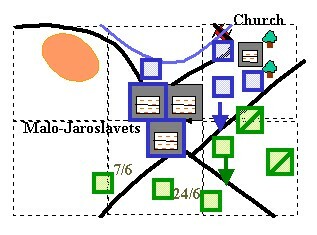 2) Command & Control: The modification proposed by Michael Rasmussen (Message 4842 in the news group 'napsbattles' of YAHOO) is used. 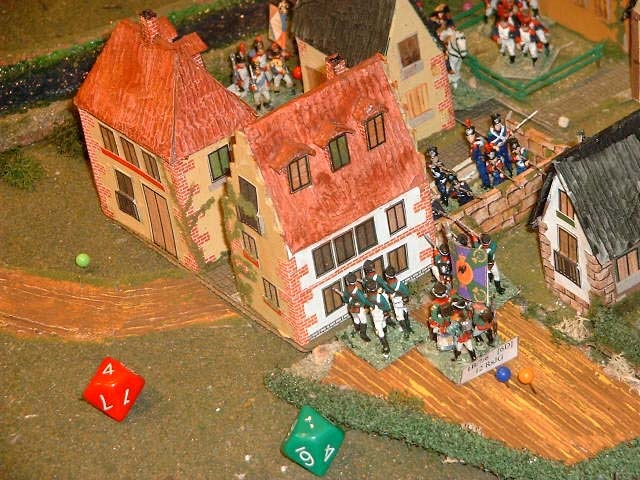 There are two command spans to the Army Commander: the normal (printed in the labels) and other (lesser) that is used to control generals or units at more than one command level below. 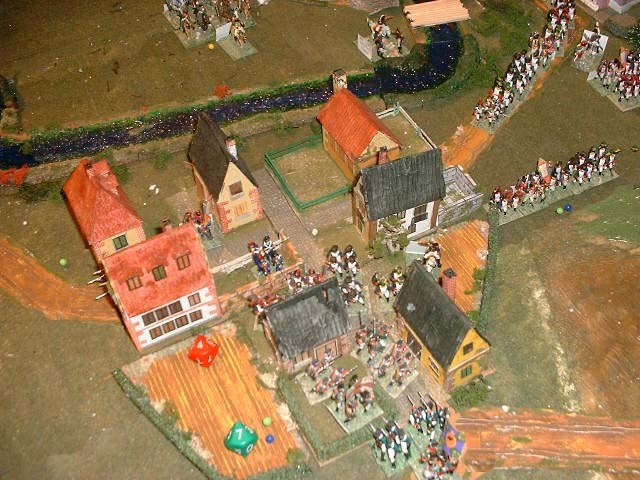 3) Routed units are allowed to auto-reformed, without an attached General, with an aditional '-3' modifier (they are disordered). 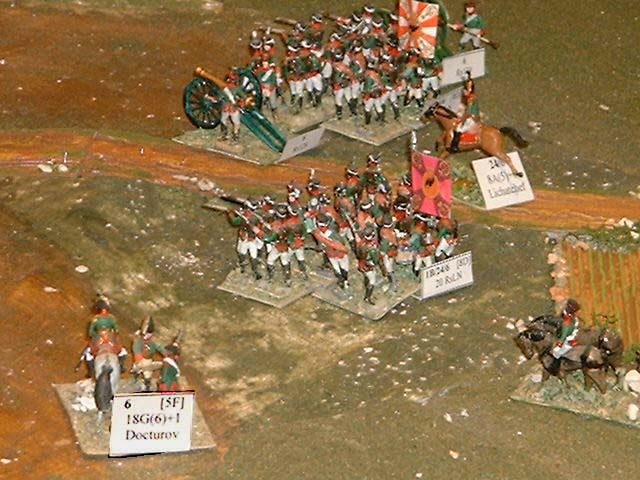 4) Disordered units may fire with an aditional '-3' modifier. 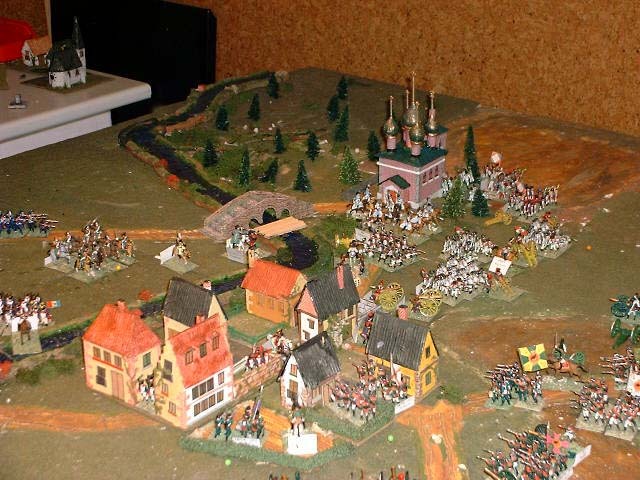 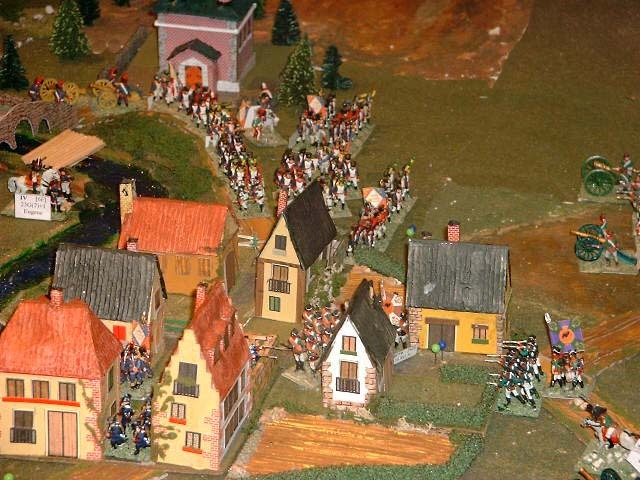 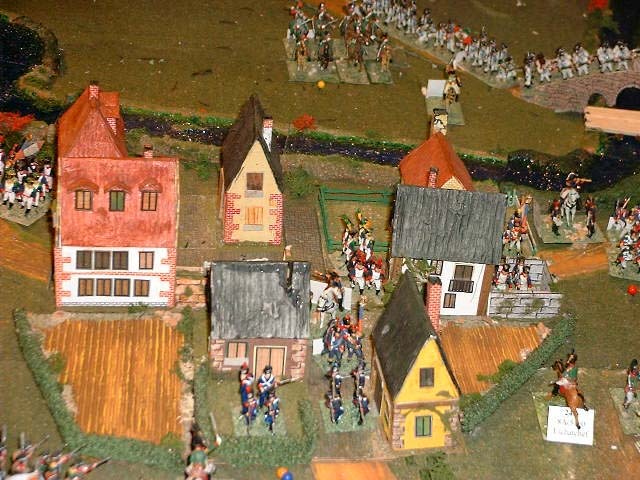 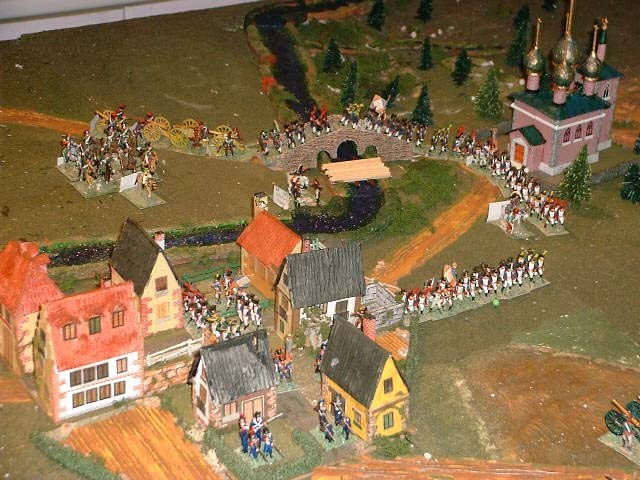 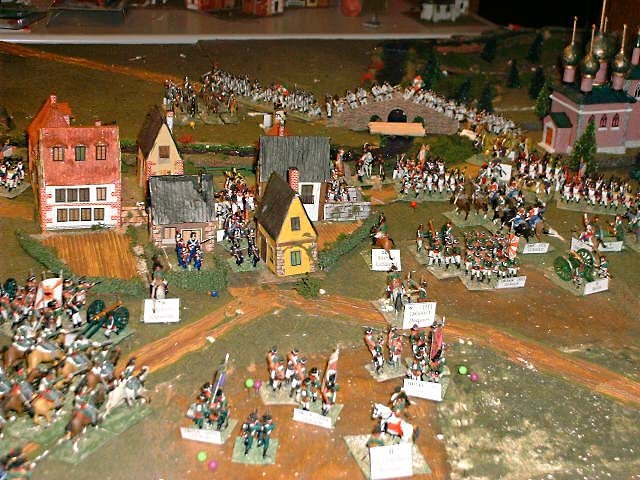 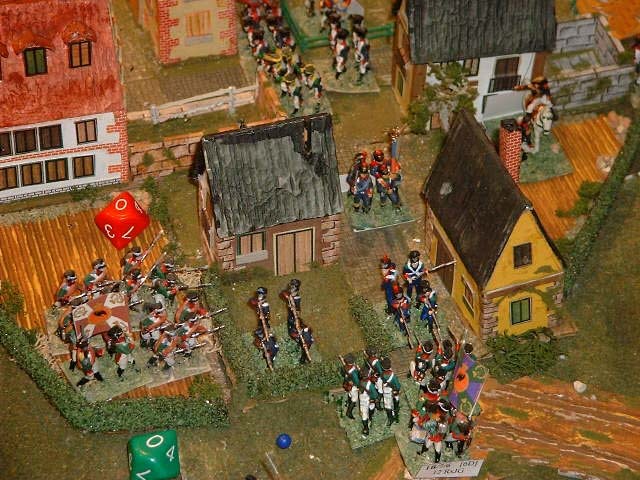 The French try to deploy in the town. 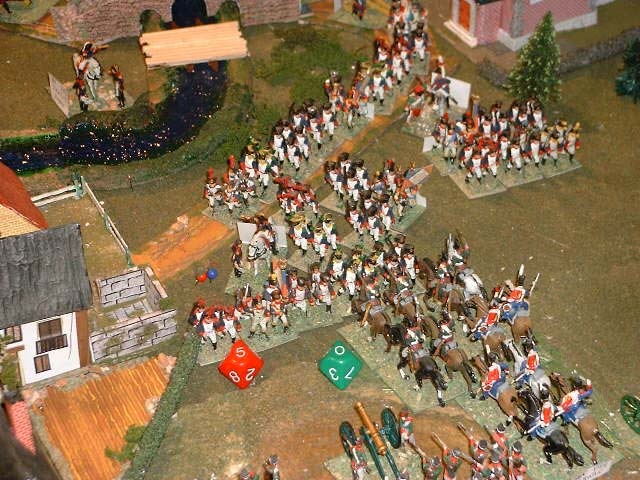 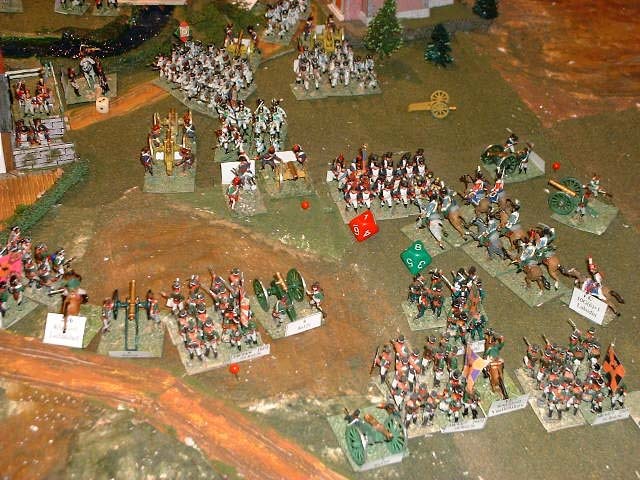 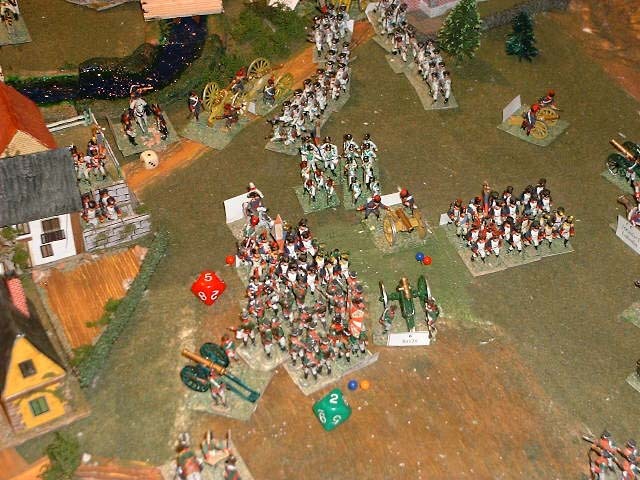 The Russians attack them and there is a draw, but the previously disordered French must to withdraw. 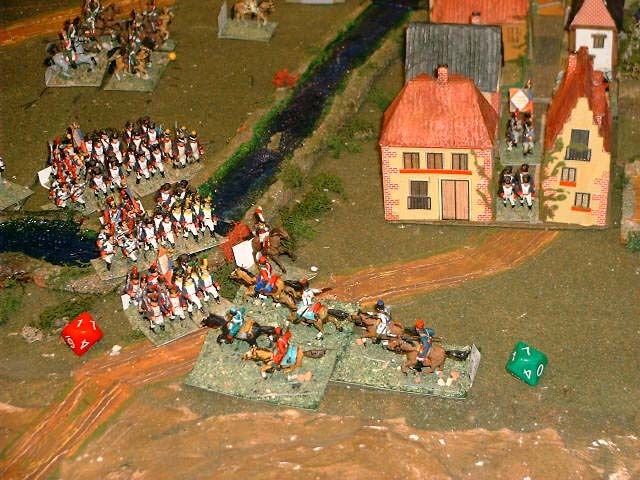 The Russian Guard Light cavalry attacks to the French infantry located out of Malo-Jaroslavets (1). 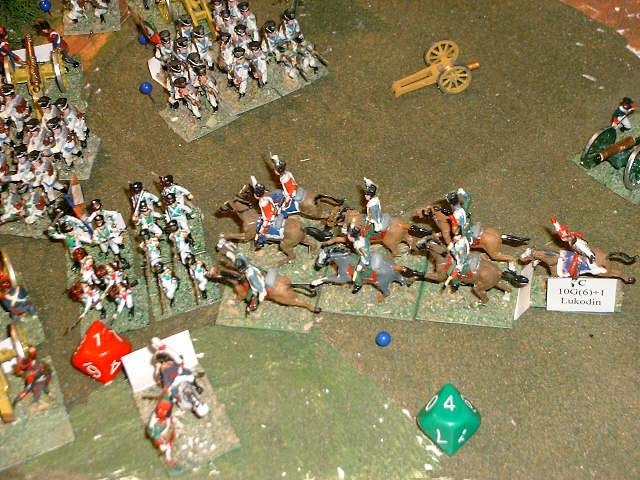 These, disordered and taken in line, fail the square and are routed (2). 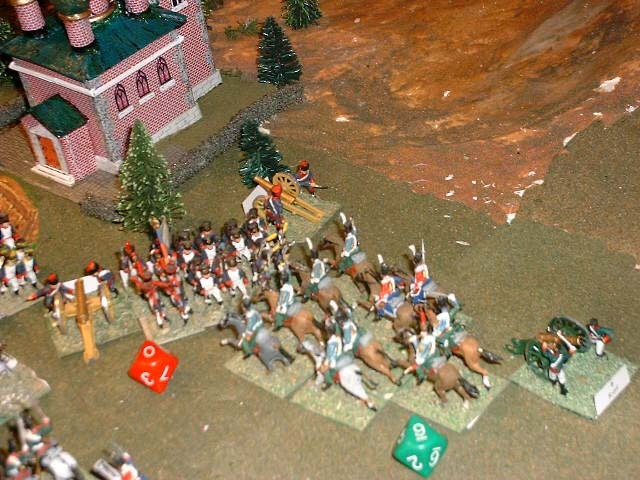 The Russian cavalry, after failing the 'recall' attack to the disordered french, just ejected from the town (3), also routing them (4) and remaining disordered 'in situ'. 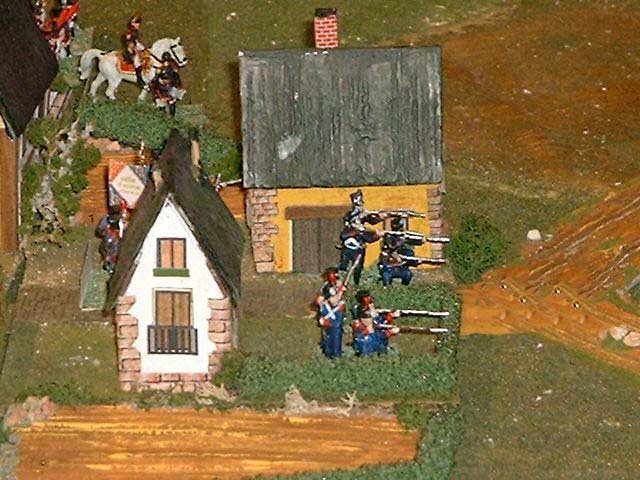 Russian jagers attack the French light without succes. 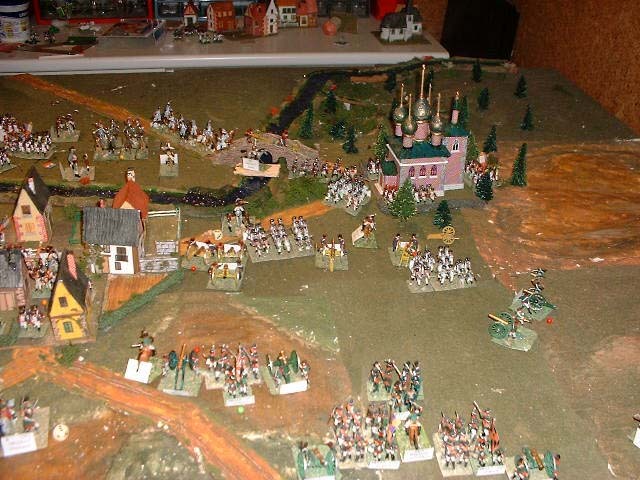 At the other side of the town, more Russian cavalry enters in scene, but this time the French form square and reject them. 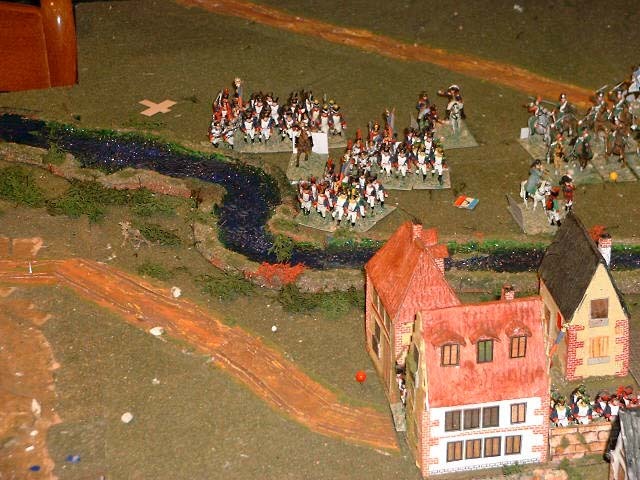 The Russians attack again the French but are rejected and during the withdrawal are fully routed. 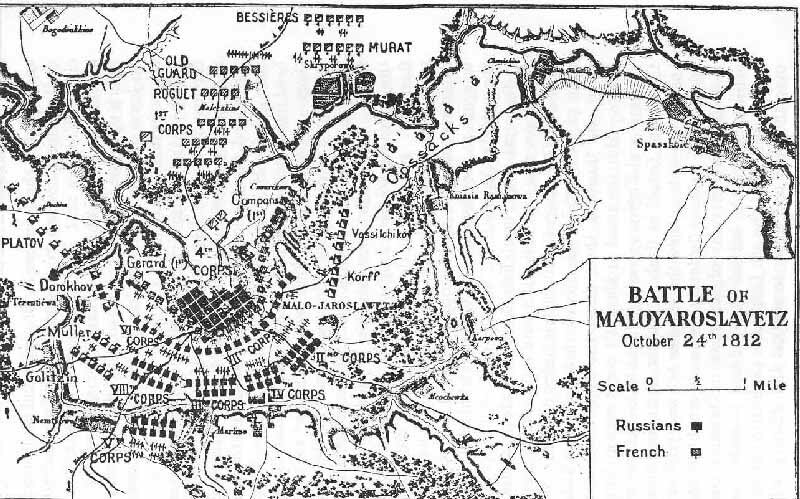 11.00 a.m. and the French have rejected the first Russian attacks: the routed units have rallied and the French infantry occupy 2/3 of Malo-Jaroslavets. 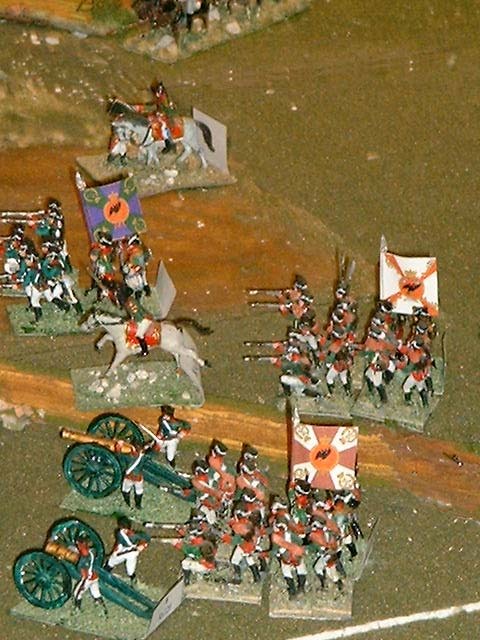 The Italian infantry of the IV Corps is arriving. 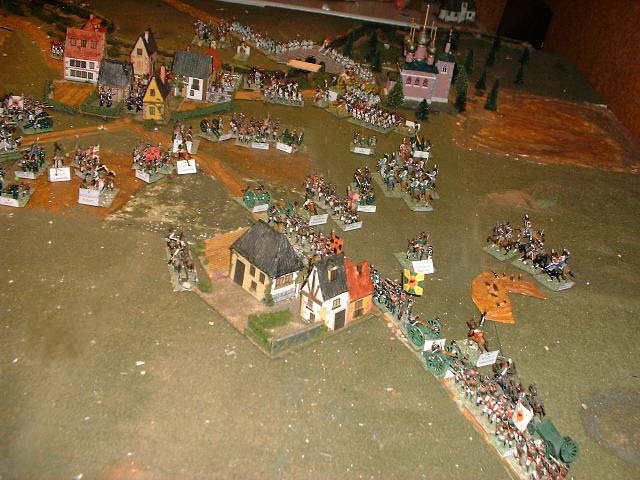 The French infantry has fully expulsed the Russian from Malo-Jaroslavets, but Russian refoircements, including Kutusov, are arriving. 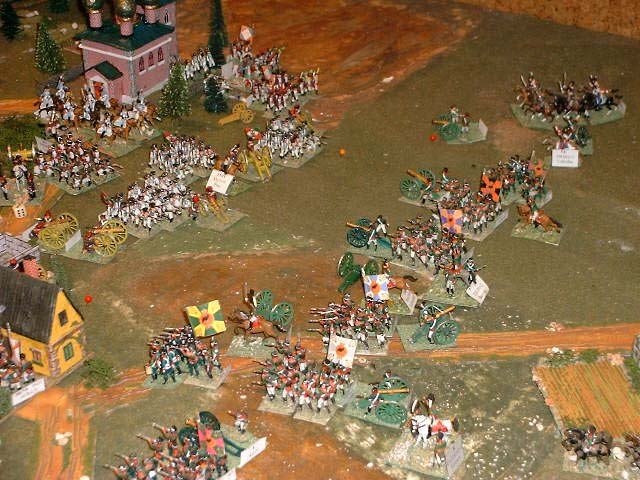 Russian cavalry attacks 2B/14/IV that fails square and is routed. 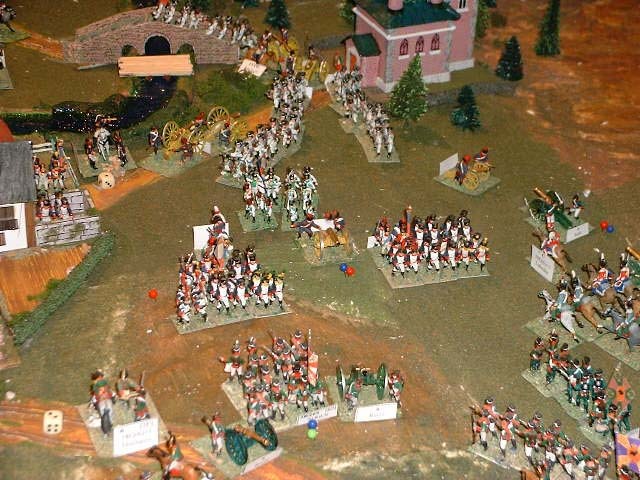 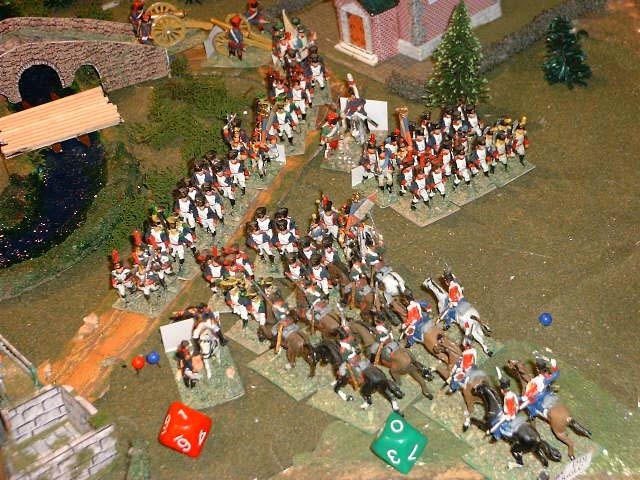 The Regiment Jose Napoleon also fails square and is routed. 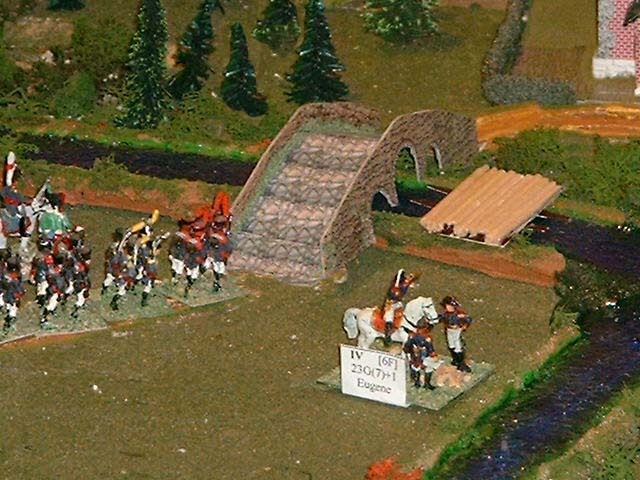 After a period of re-organization, the Italian infantry takes the bridge-head. 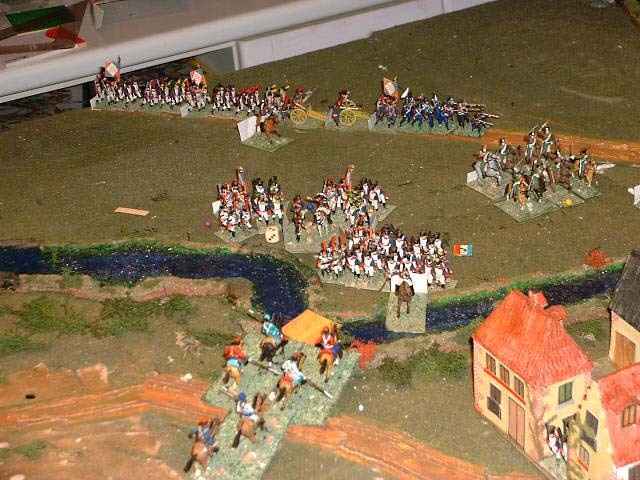 Meanwhile, Davout is probing for a ford (and Napoleon has arrived!). 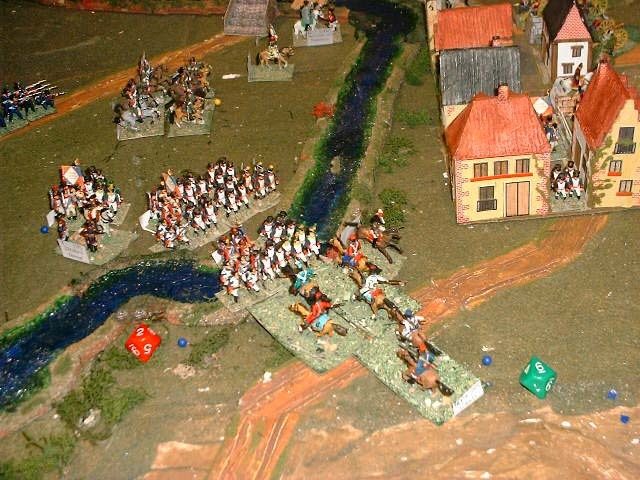 After 1-hour probing, Gerard finds a ford and cross the river, but the Cossacks attack him and rout two units that failed square (very rough terrain).